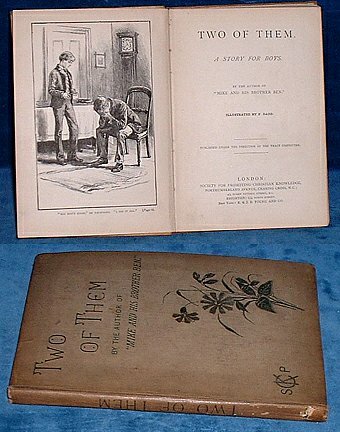 Author: AUTHOR OF "MIKE AND HIS BROTHER BEN"
Description: London, Society for Promoting Christian Knowledge New York : E. & J.B. Young and Co 1887) according to British Library Frontispiece by F. Dadd. Title page imprint has 4 addresses for SPCK Publisher. . 170x110mm buff cloth with floral emblem (tips rubbed/bit marked or soiled) 78pp+2p publisher's catalogue. Ownership inscription on pastedown dated 1891 & church Sunday school stamp under the name. Clean and tight though covers slightly bowed. *Story of twins taken in by relatives who do not really want or love them and the spoilt elder cousin who steals and blames the boys and later maliciously tells one twin that the other has died.